There has been a lot of ink spilled on the retracted and disowned “memo” titled Three Myths of Copyright that was posted on the Republican Study Committee (RSC) website. Notwithstanding the fictional revisionist history of the op-ed the usual suspects are insisting on grand conspiracy theories worthy of a tin foil hat. For those who are unaware the RSC “memo” was authored by one Hill staffer working at RSC named Derek Khanna. Shortly after the memo was posted on the RSC website, it appeared nearly simultaneously on several locations in the anti-copyright echo chamber (e.g., Ars Technica’s Tim Lee, Techdirt, etc.). Within hours of its posting, the “memo” was not only removed by the RSC, but also disavowed by the organization itself. It’s important to note that Mr. Khanna acknowledged (on Reddit) that he was freelancing–no one asked Mr. Khanna to write the memo. How he was able to post the memo on the RSC’s website–which would tend to give the memo the imprimatur of the RSC to the casual reader–is anyone’s guess (although someone surely must know). So if the RSC didn’t request it, we wonder where the inspiration came from as the memo appears to repeat many of the same old tired talking points we see repeatedly in the anti-copyright and tech blogosphere echo chamber. Some may suspect that Khanna could be hoping to earn favor in the corporate sector who have the same goals in seeing artists rights in copyright diminished, but who knows. Perhaps a staffer at the end of his run with the committee tried to shoot a three pointer as the clock was running out? These are clearly areas that Google is interested in–particularly as it is widely rumored that Google is the outside contractor for the National Security Agency’s massive data collection facility at Bluffside, Utah (in Rep. Jason Chaffetz’ district). William Patry currently serves as senior copyright counsel to Google Inc. Vint Cerf has worked for Google as a Vice President and Chief Internet Evangelist since September 2005. Not withstanding where the inspiration may have come from for the erroneous memo, perhaps the events are best stated by the fantastic analysis written by Thomas Sydnor II & Debbie Rose titled, “Capitalist Copyrights: A Republican Reply to “Three Myths about Copyright. “Three Myths claimed that US copyright laws violate “nearly every tenet of laissez fair capitalism” and constitute “corporate welfare” that thwart capitalism, hamper science, stifle libraries, penalize journalism, hurt innovation and consumers, and even conceal Nazis. The next day, the RSC Executive Director firmly disowned Three Myths. He explained that it had been “published without adequate review within the RSC” and that it violated RSC publication standards because it failed “to provide informative analysis of major policy issues… that accounts for the range of perspectives held by RSC Members and among conservatives….” The stated reasons for the RSC disavowal seemed valid, especially since many Republicans consider copyrights to be one of the many private property rights that encourage private production of valuable goods, services, and books. But Khanna then undermined the RSC by publicly embracing the just-disowned paper and associating himself with the “tech community” at TechDirt: “I am the author of this memo, and I hope the tech community continues to add to these ideas….” Khanna then appended a link to… TechDirt. Predictably, “copyright skeptics” erupted in outrage. Skeptics then accused the RSC of disowning the typo-ridden Three Myths—not because it actually was uninformative and biased—but because bad copyright-industry lobbyists must have strong-armed the stronger-armed RSC into suppressing Three Myths because it had spoken truth to power. To assess the validity of such accusations, the quality of the analyses in Three Myths can be tested against the RSC’s standards for publication and external realities—a test that Three Myths fails miserably. But that’s not the end of it. Slate reported later on that Derek Khanna was separated from the RSC. Of course this wouldn’t be the least bit surprising given the information above (but this also doesn’t appear to be verified either). Don’t shed a tear for Derek, we’re sure he’ll land with some good opportunities, perhaps even at Google? The so called myths are completely deconstructed by the amazing and always insightful work of Terry Hart at CopyHype. The two part analysis are titled Republican Study Committee Policy Brief on Copyright: Part 1 and Republican Study Committee Policy Brief on Copyright: Part 2 respectively. 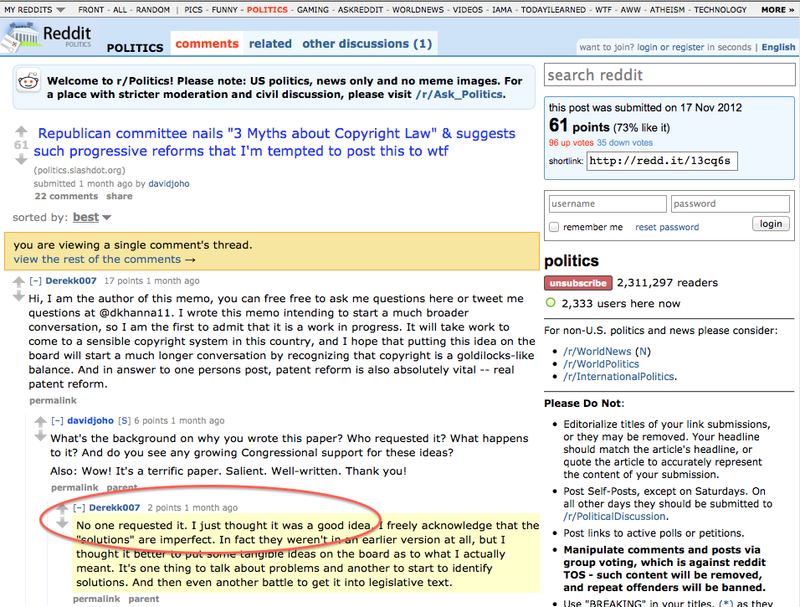 What the irrational anti-copyright movement had hoped would give them legitimacy in the form of an endorsement from a major political party has instead had the opposite effect of highlighting the desperate attempts to rewrite history in such a shallow and over reaching way as to invalidate an honest debate or dialog based in facts. No doubt, somewhere out there is basis of Khanna’s “memo” and it’s unlikely that he did little more than parrot the existing talking points of those who rallied around him in the wake of the memo’s demise. Derek Khanna, a junior and executive political director of the Massachusetts Alliance of College Republicans, and his friend Trevor Lair, the organization’s chairman, have launched a Web site to gather signatures to petition Samuel J. Werzulbacher to challenge Rep. Marcy Kaptur, D-Ohio, in 2010. Not to mention “Derek Khanna Removed from Student Government Association Senate Meeting” in his school daze.